The four grantees present were Milka Chepkorir Kuto and Julius Karanja Mbatia from Kenya, Mariana Monteiro from Brazil and Lina Fernanda Rengifo from Colombia. 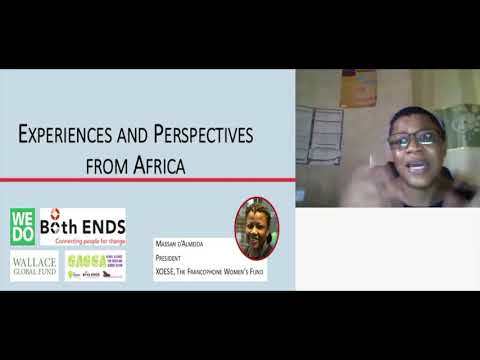 Two other grantees, Siyabonga Myeza from South Africa and Illia Yeremenko from Ukraine were unable to join us, but recorded a video to contribute. The meeting intended to facilitate a fun exchange of experiences from all sides. First, Irene Dankelman and Sjef Langeveld from the advisory committee gave more insights about Joke Waller Hunter's life story and why she has entrusted Both ENDS in achieving her wish to support young environmental CSO leadership within developing countries. Irene and Sjef, who both are instrumental to where Both ENDS and JWHi currently stand, clearly articulated the special life path Joke has walked and her connections to Both ENDS. In the second part, the advisory committee and the Both ENDS staff could listen to very inspiring stories from our grantees. This was very special, because it was great to hear grantees explaining their motivation, ideas and activities beyond what we usually read on paper when doing the selection and administrative tasks. Julius spoke about his dream to become a green champion within Kenya, Milka talked about the importance of having a Master's degree (on gender and environment) to achieve more impact, Mariana laid out the importance of having a better knowledge of the legal frameworks regarding her work in Forum Suape, and Lina explained how she envisions enhanced sustainable landscape planning in Cali, her city in Colombia. Although time was short, it was great to see so many parallel challenges, opportunities and options identified to work together, even among just these four grantees. We can only imagine what happens when a network of all current and former 265+ grantees could be activated. It makes us even more motivated to build our grantee network, which our new volunteer William has started to work on last month, as well as exploring many other possibilities for the future of the JWH initiative. Although the human rights to water, food and a healthy environment have been incorporated in international legal instruments, in many countries these rights are violated on a massive scale. Women suffer disproportionally, because it is mostly still their role to feed the family and fetch water, but also because they lack decision-making power over the use of natural resources.